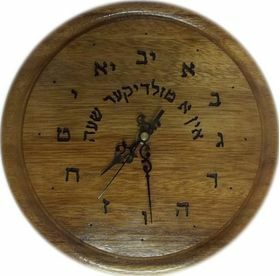 This handmade wooden Yiddish wall clock made with love. This wood it is looks very nice. The clock numbers in Hebrew characters. It written in Yiddish אין א מזלדיקער שעה "Good luck"
The dimensions are: D 9.7", T 0.5"
The clock mechanism included battery AA.